Necrotizing fasciitis has also been referred to as hemolytic streptococcal gangrene, Meleney ulcer, acute dermal gangrene, hospital gangrene, suppurative fasciitis, and synergistic necrotizing cellulitis. Fournier gangrene is a form of necrotizing fasciitis that is localized to the scrotum and perineal area. Necrotizing fasciitis may occur as a complication of a variety of surgical procedures or medical conditions, including cardiac catheterization,  vein sclerotherapy,  and diagnostic laparoscopy,  among others. [6, 7, 8, 9, 10, 11, 12] It may also be idiopathic, as in scrotal or penile necrotizing fasciitis. A variant of necrotizing fasciitis type I is saltwater necrotizing fasciitis, in which an apparently minor skin wound is contaminated with saltwater containing a Vibrio species. Because of the presence of gas-forming organisms, subcutaneous air is classically described in necrotizing fasciitis. This may be seen only on radiographs or not at all. The frequency of necrotizing fasciitis has been on the rise because of an increase in immunocompromised patients with diabetes mellitus, cancer, alcoholism, vascular insufficiencies, organ transplants, HIV infection, or neutropenia. Since 1883, more than 500 cases of necrotizing fasciitis have been reported in the literature. There may be an increased incidence in African and Asian countries; however, because of the lack of recorded cases, the true incidence is not known. The mean age of a patient with necrotizing fasciitis is 38-44 years. This disease rarely occurs in children. Pediatric cases have been reported from resource-poor nations where poor hygiene is prevalent. The male-to-female ratio is 2-3:1. These infections can be difficult to recognize in their early stages, but they rapidly progress. (see Clinical and Workup). They require aggressive treatment to combat the associated high morbidity and mortality (see Treatment). Images of necrotizing fasciitis are shown below. Left upper extremity shows necrotizing fasciitis in an individual who used illicit drugs. Cultures grew Streptococcus milleri and anaerobes (Prevotella species). Patient would grease, or lick, the needle before injection. Sixty-year-old woman who had undergone postvaginal hysterectomy and repair of a rectal prolapse has a massive perineal ulceration with foul-smelling discharge. Cultures revealed Escherichia coli and Bacteroides fragilis. The diagnosis was perineal gangrene. Necrotizing fasciitis at a possible site of insulin injection in the left upper part of the thigh in a 50-year-old obese woman with diabetes. Necrotizing fascitis of entire thoracolumbar posterior area in 20-year-old patient with chronic myelogenous leukemia and neutropenia (WBC count, 680/uL). Cultures revealed gram-negative Pseudomonas species and Bacteroides fragilis. Smith et al first classified soft tissue infections as either local or spreading. Lewis later further classified soft tissue infections into either necrotizing or non-necrotizing. He further subdivided these infections into either focal or diffuse. The cofounders of this distinguished Foundation are necrotizing fasciitis survivors, Donna Batdorff and Jackie Roemmele. In the 16 years since these 2 women have teamed up to be leaders in this Society, they have diligently worked in concert with a dedicated volunteer staff to fulfill the Foundation’s mission to increase awareness about necrotizing fasciitis. Foundation activities include public speaking and outreach efforts regarding necrotizing fasciitis throughout the world to educate the medical community and to help save lives from this often misdiagnosed, rapidly fatal disease. See National Necrotizing Fasciitis Foundation. During the last 2 decades, researchers have found that necrotizing fasciitis is usually polymicrobial rather than monomicrobial. [27, 28, 29] Anaerobic bacteria are present in most necrotizing soft-tissue infections, usually in combination with aerobic gram-negative organisms. Anaerobic organisms proliferate in an environment of local tissue hypoxia in those patients with trauma, recent surgery, or medical compromise. Facultative aerobic organisms grow because polymorphonuclear neutrophils (PMNs) exhibit decreased function under hypoxic wound conditions. This growth further lowers the oxidation/reduction potential, enabling more anaerobic proliferation and, thus, accelerating the disease process. Carbon dioxide and water are the end products of aerobic metabolism. Hydrogen, nitrogen, hydrogen sulfide, and methane are produced from the combination of aerobic and anaerobic bacteria in a soft tissue infection. These gases, except carbon dioxide, accumulate in tissues because of reduced water solubility. Bacteroides fragilis is usually noted as part of a mixed flora in combination with E coli. B fragilis does not directly cause these infections, but it does play a part in reducing interferon production and the phagocytic capacity of macrophages and PMNs. A variant synergistic necrotizing cellulitis is considered to be a form of necrotizing fasciitis, but some authorities feel that it is actually a nonclostridial myonecrosis. This condition begins in the same manner as necrotizing fasciitis, but it progresses rapidly to involve wide areas of deeper tissue and muscle at an earlier stage than might be expected. Severe systemic toxicity occurs. Anaerobic streptococci, occasionally seen in intravenous drug users, cause many forms of nonclostridial myonecrosis (see the image below). Some cases of necrotizing fasciitis can be caused by Vibrio vulnificus. This organism is seen more often in patients with chronic liver dysfunction, and it often follows the consumption of raw seafood. 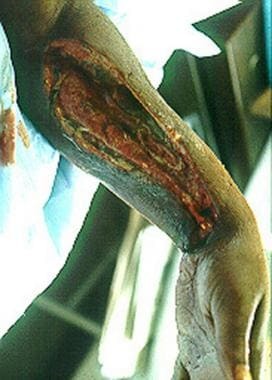 V vulnificus may cause subcutaneous bleeding. Organisms spread from the subcutaneous tissue along the superficial and deep fascial planes, presumably facilitated by bacterial enzymes and toxins. This deep infection causes vascular occlusion, ischemia, and tissue necrosis. Superficial nerves are damaged, producing the characteristic localized anesthesia. Septicemia ensues with systemic toxicity. Important bacterial factors include surface protein expression and toxin production. M-1 and M-3 surface proteins, which increase the adherence of the streptococci to the tissues, also protect the bacteria against phagocytosis by neutrophils. It was found that wild-type mtsR function is required for group A Streptococcus to cause necrotizing fasciitis in mice and nonhuman primates. It was speculated that a naturally occurring single-nucleotide mutation dramatically alters virulence by dysregulating a multiple gene virulence axis. Severe myositis accompanying septic necrotizing fasciitis may be caused by a Panton-Valentine leukocidin–positive S aureus strain. Immunostaining may document strong binding of the Panton-Valentine leukocidin toxin to necrotic muscle tissues. Surgical procedures may cause local tissue injury and bacterial invasion, resulting in necrotizing fasciitis. These procedures include surgery for intraperitoneal infections and drainage of ischiorectal and perianal abscesses. Intramuscular injections and intravenous infusions may lead to necrotizing fasciitis. Minor insect bites may set the stage for necrotizing infections. Streptococci introduced into the wounds may be prominent initially, but the bacteriologic pattern changes with hypoxia-induced proliferation of anaerobes. Local ischemia and hypoxia can occur in patients with systemic illnesses (eg, diabetes). Host defenses can be compromised by underlying systemic diseases favoring the development of these infections. Illnesses such as diabetes or cancer have been described in over 90% of cases of progressive bacterial gangrene. Of patients with necrotizing fasciitis, 20-40% are diabetic. As many as 80% of Fournier gangrene cases occur in people with diabetes. In some series, as many as 35% of patients were alcoholics. However, approximately one half of the cases of streptococcal necrotizing fasciitis occur in young and previously healthy people. Studies have shown a possible relationship between the use of nonsteroidal anti-inflammatory agents (NSAIDs), such as ibuprofen, and the development of necrotizing fasciitis during varicella infections. Additional studies are needed to establish whether ibuprofen use has a causal role in the development of necrotizing fasciitis and its complications during varicella infections. This has not previously been described. A synergistic infection with a facultative anaerobic bacterium may be significant. In 1 patient, Phycomycetes appeared to be responsible for necrotizing fasciitis. Streptococcus pneumoniae is a rare cause of necrotizing fasciitis. In one patient, S pneumoniae serotype 5 was also isolated. This serotype 5 antigen is included in the polysaccharide 23-valent pneumococcal vaccine, highlighting the value of pneumococcal immunization. In type I necrotizing fasciitis, anaerobic and facultative bacteria work synergistically to cause what may initially be mistaken for a simple wound cellulitis. A variant of type I necrotizing fasciitis is saltwater necrotizing fasciitis in which an apparently minor skin wound is contaminated with saltwater containing a Vibrio species. In type II necrotizing fasciitis, varicella infection and the use of nonsteroidal anti-inflammatory drugs may be predisposing factors. Type III necrotizing fasciitis is usually caused by Clostridium perfringens. When type III necrotizing fasciitis occurs spontaneously, C septicum is more likely to be the etiologic agent; these cases usually occur in association with colon cancer or leukemia. The reported mortality in patients with necrotizing fasciitis has ranged from 20% to as high as 80%. [40, 27, 29, 41] Pathogens, patient characteristics, infection site, and speed of treatment are among the variables that affect survival. The mean age of survivors is 35 years. The mean age of nonsurvivors is 49 years. In a retrospective review of craniocervical necrotizing fasciitis, Mao et al reported a survival rate of 60% for patients with thoracic extension (6 of 10) compared with 100% for those without thoracic extension. Lower overall survival for the patients in the thoracic extension group was attributed to older patient age, greater comorbidity, need for more extensive surgical debridement, and increased postoperative complications. Similarly, McHenry et al reported that the average time from admission to operation was 90 hours in nonsurvivors of necrotizing soft-tissue infections; in survivors, this average time was 25 hours. Early debridement of the infection was obviously associated with a significant decrease in mortality. Necrotizing fasciitis has become sufficiently common in the United States that a National Necrotizing Fasciitis Foundation has been formed. The cofounders of this foundation are survivors of necrotizing fasciitis. The goals of this foundation are to increase awareness about necrotizing fasciitis, to educate the medical community, and to help save lives from this often misdiagnosed, rapidly fatal disease. The Foundation’s Web site has stories about survivors of necrotizing fasciitis with color photographs. The Foundation provides a list of journal articles as well as 8 brief reports on necrotizing fasciitis that can be downloaded at no cost. Misiakos EP, Bagias G, Patapis P, Sotiropoulos D, Kanavidis P, Machairas A. Current concepts in the management of necrotizing fasciitis. Front Surg. 2014. 1:36. [Medline]. [Full Text]. Hakkarainen TW, Kopari NM, Pham TN, Evans HL. Necrotizing soft tissue infections: review and current concepts in treatment, systems of care, and outcomes. Curr Probl Surg. 2014 Aug. 51 (8):344-62. [Medline]. [Full Text]. Chan HT, Low J, Wilson L, Harris OC, Cheng AC, Athan E. Case cluster of necrotizing fasciitis and cellulitis associated with vein sclerotherapy. Emerg Infect Dis. 2008 Jan. 14(1):180-1. [Medline]. [Full Text]. Tung-Yiu W, Jehn-Shyun H, Ching-Hung C, Hung-An C. Cervical necrotizing fasciitis of odontogenic origin: a report of 11 cases. J Oral Maxillofac Surg. 2000 Dec. 58(12):1347-52; discussion 1353. [Medline]. Gore MR. Odontogenic necrotizing fasciitis: a systematic review of the literature. BMC Ear Nose Throat Disord. 2018. 18:14. [Medline]. [Full Text]. Quirk WF Jr, Sternbach G. Joseph Jones: infection with flesh eating bacteria. J Emerg Med. 1996 Nov-Dec. 14(6):747-53. [Medline]. Fournier A. Gangrene foudroyante de la verge. Semaine Med. 1883. 3:345. Meleney FL. 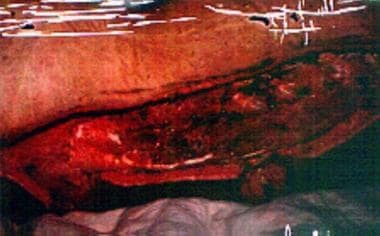 Hemolytic streptococcus gangrene. Arch Surg. 1924. 9:317-364. Wilson B. Necrotizing fasciitis. Am Surg. 1952 Apr. 18(4):416-31. [Medline]. Smith AJ, Daniels T, Bohnen JM. Soft tissue infections and the diabetic foot. Am J Surg. 1996. 7S:172(Suppl.6A). Lewis RT. Soft tissue infections. World J Surg. 1998 Feb. 22(2):146-51. [Medline]. Edlich RF, Cross CL, Dahlstrom JJ, Long WB 3rd. Modern concepts of the diagnosis and treatment of necrotizing fasciitis. J Emerg Med. 2010 Aug. 39(2):261-5. [Medline]. Rausch J, Foca M. Necrotizing fasciitis in a pediatric patient caused by lancefield group g streptococcus: case report and brief review of the literature. Case Rep Med. 2011. Vayvada H, Demirdover C, Menderes A, Karaca C. [Necrotizing fasciitis: diagnosis, treatment and review of the literature]. Ulus Travma Acil Cerrahi Derg. 2012 Nov. 18(6):507-13. [Medline]. Swain RA, Hatcher JC, Azadian BS, et al. A five-year review of necrotising fasciitis in a tertiary referral unit. Ann R Coll Surg Engl. 2013 Jan. 95(1):57-60. [Medline]. [Full Text]. Bratdorff D, Roemmele J. National Necrotizing Fasciitis Foundation (NNFF) 1997-2009. Available at http://www.nnff.org. Accessed: April 17, 2013. Bahebeck J, Sobgui E, Loic F, Nonga BN, Mbanya JC, Sosso M. Limb-threatening and life-threatening diabetic extremities: clinical patterns and outcomes in 56 patients. J Foot Ankle Surg. 2010 Jan-Feb. 49(1):43-6. [Medline]. Stone DR, Gorbach SL. Necrotizing fasciitis. The changing spectrum. Dermatol Clin. 1997 Apr. 15(2):213-20. [Medline]. Rouse TM, Malangoni MA, Schulte WJ. Necrotizing fasciitis: a preventable disaster. Surgery. 1982 Oct. 92(4):765-70. [Medline]. Andreasen TJ, Green SD, Childers BJ. Massive infectious soft-tissue injury: diagnosis and management of necrotizing fasciitis and purpura fulminans. Plast Reconstr Surg. 2001 Apr 1. 107(4):1025-35. [Medline]. McHenry CR, Piotrowski JJ, Petrinic D, Malangoni MA. Determinants of mortality for necrotizing soft-tissue infections. Ann Surg. 1995 May. 221(5):558-63; discussion 563-5. [Medline]. [Full Text]. Morgan WR, Caldwell MD, Brady JM, Stemper ME, Reed KD, Shukla SK. Necrotizing fasciitis due to a methicillin-sensitive Staphylococcus aureus isolate harboring an enterotoxin gene cluster. J Clin Microbiol. 2007 Feb. 45(2):668-71. [Medline]. [Full Text]. Cheng NC, Chang SC, Kuo YS, Wang JL, Tang YB. 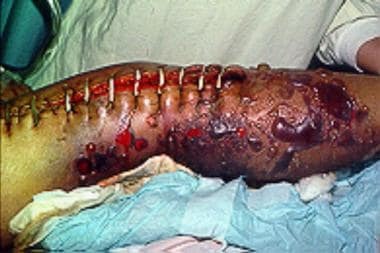 Necrotizing fasciitis caused by methicillin-resistant Staphylococcus aureus resulting in death. A report of three cases. J Bone Joint Surg Am. 2006 May. 88(5):1107-10. [Medline]. Olsen RJ, Sitkiewicz I, Ayeras AA, et al. Decreased necrotizing fasciitis capacity caused by a single nucleotide mutation that alters a multiple gene virulence axis. Proc Natl Acad Sci U S A. 2010 Jan 12. 107(2):888-93. [Medline]. [Full Text]. Lehman D, Tseng CW, Eells S, et al. Staphylococcus aureus Panton-Valentine leukocidin targets muscle tissues in a child with myositis and necrotizing fasciitis. Clin Infect Dis. 2010 Jan 1. 50(1):69-72. [Medline]. Hung TH, Tsai CC, Tsai CC, et al. Liver cirrhosis as a real risk factor for necrotising fasciitis: a three-year population-based follow-up study. Singapore Med J. 2014 Jul. 55(7):378-82. [Medline]. Tang WM, Ho PL, Yau WP, Wong JW, Yip DK. Report of 2 fatal cases of adult necrotizing fasciitis and toxic shock syndrome caused by Streptococcus agalactiae. Clin Infect Dis. 2000 Oct. 31(4):E15-7. [Medline]. Sendi P, Johansson L, Dahesh S, et al. Bacterial phenotype variants in group B streptococcal toxic shock syndrome. Emerg Infect Dis. 2009 Feb. 15(2):223-32. [Medline]. [Full Text]. Parcell BJ, Wilmshurst AD, France AJ, Motta L, Brooks T, Olver WJ. Injection anthrax causing compartment syndrome and necrotising fasciitis. J Clin Pathol. 2011 Jan. 64(1):95-6. [Medline]. Tang WM, Fung KK, Cheng VC, Lucke L. Rapidly progressive necrotising fasciitis following a stonefish sting: a report of two cases. J Orthop Surg (Hong Kong). 2006 Apr. 14(1):67-70. [Medline]. van Stigt SF, de Vries J, Bijker JB, et al. Review of 58 patients with necrotizing fasciitis in the Netherlands. World J Emerg Surg. 2016. 11:21. [Medline]. [Full Text]. Simsek Celik A, Erdem H, Guzey D, et al. Fournier's gangrene: series of twenty patients. Eur Surg Res. 2011. 46(2):82-6. [Medline]. Hsiao CT, Weng HH, Yuan YD, Chen CT, Chen IC. Predictors of mortality in patients with necrotizing fasciitis. Am J Emerg Med. 2008 Feb. 26(2):170-5. [Medline]. Chang CP, Hsiao CT, Lin CN, Fann WC. Risk factors for mortality in the late amputation of necrotizing fasciitis: a retrospective study. World J Emerg Surg. 2018. 13:45. [Medline]. [Full Text]. Lee CY, Kuo LT, Peng KT, Hsu WH, Huang TW, Chou YC. Prognostic factors and monomicrobial necrotizing fasciitis: gram-positive versus gram-negative pathogens. BMC Infect Dis. 2011 Jan 5. 11:5. [Medline]. [Full Text]. Cheng NC, Su YM, Kuo YS, Tai HC, Tang YB. Factors affecting the mortality of necrotizing fasciitis involving the upper extremities. Surg Today. 2008. 38(12):1108-13. [Medline]. Mao JC, Carron MA, Fountain KR, et al. Craniocervical necrotizing fasciitis with and without thoracic extension: management strategies and outcome. Am J Otolaryngol. 2009 Jan-Feb. 30(1):17-23. [Medline]. Friederichs J, Torka S, Militz M, Buhren V, Hungerer S. Necrotizing soft tissue infections after injection therapy: higher mortality and worse outcome compared to other entry mechanisms. J Infect. 2015 Jun 3. [Medline]. Light TD, Choi KC, Thomsen TA, et al. Long-term outcomes of patients with necrotizing fasciitis. J Burn Care Res. 2010 Jan-Feb. 31(1):93-9. [Medline]. Olafsson EJ, Zeni T, Wilkes DS. A 46-year-old man with excruciating shoulder pain. Chest. 2005 Mar. 127(3):1039-44. [Medline]. Simonart T, Simonart JM, Derdelinckx I, et al. Value of standard laboratory tests for the early recognition of group A beta-hemolytic streptococcal necrotizing fasciitis. Clin Infect Dis. 2001 Jan. 32(1):E9-12. [Medline]. Stevens DL, Bisno AL, Chambers HF, et al. Practice guidelines for the diagnosis and management of skin and soft tissue infections: 2014 update by the infectious diseases society of America. Clin Infect Dis. 2014 Jul 15. 59(2):147-59. [Medline]. [Full Text]. Drake DB, Woods JA, Bill TJ, et al. Magnetic resonance imaging in the early diagnosis of group A beta streptococcal necrotizing fasciitis: a case report. J Emerg Med. 1998 May-Jun. 16(3):403-7. [Medline]. Fugitt JB, Puckett ML, Quigley MM, Kerr SM. Necrotizing fasciitis. Radiographics. 2004 Sep-Oct. 24(5):1472-6. [Medline]. Chao HC, Kong MS, Lin TY. Diagnosis of necrotizing fasciitis in children. J Ultrasound Med. 1999 Apr. 18(4):277-81. [Medline]. Sharif HS, Clark DC, Aabed MY, Aideyan OA, Haddad MC, Mattsson TA. MR imaging of thoracic and abdominal wall infections: comparison with other imaging procedures. AJR Am J Roentgenol. 1990 May. 154(5):989-95. [Medline]. Sandner A, Moritz S, Unverzagt S, Plontke SK, Metz D. Cervical Necrotizing Fasciitis-The Value of the Laboratory Risk Indicator for Necrotizing Fasciitis Score as an Indicative Parameter. J Oral Maxillofac Surg. 2015 Jun 5. [Medline]. Narasimhan V, Ooi G, Weidlich S, Carson P. Laboratory Risk Indicator for Necrotizing Fasciitis score for early diagnosis of necrotizing fasciitis in Darwin. ANZ J Surg. 2017 Mar 15. [Medline]. Fernando SM, Tran A, Cheng W, et al. Necrotizing Soft Tissue Infection: Diagnostic Accuracy of Physical Examination, Imaging, and LRINEC Score: A Systematic Review and Meta-Analysis. Ann Surg. 2018 Apr 18. [Medline]. El-Menyar A, Asim M, Mudali IN, Mekkodathil A, Latifi R, Al-Thani H. The laboratory risk indicator for necrotizing fasciitis (LRINEC) scoring: the diagnostic and potential prognostic role. Scand J Trauma Resusc Emerg Med. 2017 Mar 7. 25 (1):28. [Medline]. [Full Text]. Neeki MM, Dong F, Au C, et al. Evaluating the Laboratory Risk Indicator to Differentiate Cellulitis from Necrotizing Fasciitis in the Emergency Department. West J Emerg Med. 2017 Jun. 18 (4):684-9. [Medline]. [Full Text]. Namias N, Martin L, Matos L, Sleeman D, Snowdon B. Symposium: necrotizing fasciitis. Contemp Surg. 1996. 49:167-78. Lille ST, Sato TT, Engrav LH, Foy H, Jurkovich GJ. Necrotizing soft tissue infections: Obstacles in diagnosis. J Am Coll Surg. 1995. 182(1):7-11. Wronski M, Slodkowski M, Cebulski W, Karkocha D, Krasnodebski IW. Necrotizing fasciitis: early sonographic diagnosis. J Clin Ultrasound. 2011 May. 39(4):236-9. [Medline]. Parenti GC, Marri C, Calandra G, Morisi C, Zabberoni W. [Necrotizing fasciitis of soft tissues: role of diagnostic imaging and review of the literature]. Radiol Med. 2000 May. 99(5):334-9. [Medline]. Beltran J, McGhee RB, Shaffer PB, et al. Experimental infections of the musculoskeletal system: evaluation with MR imaging and Tc-99m MDP and Ga-67 scintigraphy. Radiology. 1988 Apr. 167(1):167-72. [Medline]. Tang JS, Gold RH, Bassett LW, Seeger LL. Musculoskeletal infection of the extremities: evaluation with MR imaging. Radiology. 1988 Jan. 166(1 Pt 1):205-9. [Medline]. Rahmouni A, Chosidow O, Mathieu D, et al. MR imaging in acute infectious cellulitis. Radiology. 1994 Aug. 192(2):493-6. [Medline]. Craig JG. Infection: ultrasound-guided procedures. Radiol Clin North Am. 1999 Jul. 37(4):669-78. [Medline]. Arslan A, Pierre-Jerome C, Borthne A. Necrotizing fasciitis: unreliable MRI findings in the preoperative diagnosis. Eur J Radiol. 2000 Dec. 36(3):139-43. [Medline]. Childers BJ, Potyondy LD, Nachreiner R, et al. Necrotizing fasciitis: a fourteen-year retrospective study of 163 consecutive patients. Am Surg. 2002 Feb. 68(2):109-16. [Medline]. Stamenkovic I, Lew PD. Early recognition of potentially fatal necrotizing fasciitis. The use of frozen-section biopsy. N Engl J Med. 1984 Jun 28. 310(26):1689-93. [Medline]. Bakleh M, Wold LE, Mandrekar JN, Harmsen WS, Dimashkieh HH, Baddour LM. Correlation of histopathologic findings with clinical outcome in necrotizing fasciitis. Clin Infect Dis. 2005 Feb 1. 40(3):410-4. [Medline]. Uman SJ, Kunin CM. Needle aspiration in the diagnosis of soft tissue infections. Arch Intern Med. 1975 Jul. 135(7):959-61. [Medline]. Francis J, Warren RE. Streptococcus pyogenes bacteraemia in Cambridge--a review of 67 episodes. Q J Med. 1988 Aug. 68(256):603-13. [Medline]. Crew JR, Thibodeaux KT, Speyrer MS, et al. Flow-through Instillation of Hypochlorous Acid in the Treatment of Necrotizing Fasciitis. Wounds. 2016 Feb. 28 (2):40-7. [Medline]. Chelsom J, Halstensen A, Haga T, Hoiby EA. Necrotising fasciitis due to group A streptococci in western Norway: incidence and clinical features. Lancet. 1994 Oct 22. 344(8930):1111-5. [Medline]. Wang KC, Shih CH. Necrotizing fasciitis of the extremities. J Trauma. 1992 Feb. 32(2):179-82. [Medline]. Kaufman JL. Clinical problem-solving: necrotizing fasciitis. N Engl J Med. 1994 Jul 28. 331(4):279; author reply 280. [Medline]. Adams EM, Gudmundsson S, Yocum DE, Haselby RC, Craig WA, Sundstrom WR. Streptococcal myositis. Arch Intern Med. 1985 Jun. 145(6):1020-3. [Medline]. Edlich RF, Woodard CR, Pine SA, Lin KY. Hazards of powder on surgical and examination gloves: a collective review. J Long Term Eff Med Implants. 2001. 11(1-2):15-27. [Medline]. Gear AJ, Hellewell TB, Wright HR, et al. A new silver sulfadiazine water soluble gel. Burns. 1997 Aug. 23(5):387-91. [Medline]. Stevens DL, Yan S, Bryant AE. Penicillin-binding protein expression at different growth stages determines penicillin efficacy in vitro and in vivo: an explanation for the inoculum effect. J Infect Dis. 1993 Jun. 167(6):1401-5. [Medline]. Yan S, Bohach GA, Stevens DL. Persistent acylation of high-molecular-weight penicillin-binding proteins by penicillin induces the postantibiotic effect in Streptococcus pyogenes. J Infect Dis. 1994 Sep. 170(3):609-14. [Medline]. Gemmell CG, Peterson PK, Schmeling D, et al. Potentiation of opsonization and phagocytosis of Streptococcus pyogenes following growth in the presence of clindamycin. J Clin Invest. 1981 May. 67(5):1249-56. [Medline]. [Full Text]. Stevens DL, Bryant AE, Yan S. Invasive group A streptococcal infection: New concepts in antibiotic treatment. Int J Antimicrob Agent. 1994. 4:297-301. Stevens DL, Bryant AE, Hackett SP. Antibiotic effects on bacterial viability, toxin production, and host response. Clin Infect Dis. 1995 Jun. 20 Suppl 2:S154-7. [Medline]. Edlich RF, Winters KL, Woodard CR, Britt LD, Long WB 3rd. Massive soft tissue infections: necrotizing fasciitis and purpura fulminans. J Long Term Eff Med Implants. 2005. 15(1):57-65. [Medline]. Lota AS, Altaf F, Shetty R, Courtney S, McKenna P, Iyer S. A case of necrotising fasciitis caused by Pseudomonas aeruginosa. J Bone Joint Surg Br. 2010 Feb. 92(2):284-5. [Medline]. Barry W, Hudgins L, Donta ST, Pesanti EL. Intravenous immunoglobulin therapy for toxic shock syndrome. JAMA. 1992 Jun 24. 267(24):3315-6. [Medline]. Yong JM. Necrotising fasciitis. Lancet. 1994 Jun 4. 343(8910):1427. [Medline]. Darenberg J, Ihendyane N, Sjolin J, et al. Intravenous immunoglobulin G therapy in streptococcal toxic shock syndrome: a European randomized, double-blind, placebo-controlled trial. Clin Infect Dis. 2003 Aug 1. 37(3):333-40. [Medline]. Norrby-Teglund A, Muller MP, Mcgeer A, et al. Successful management of severe group A streptococcal soft tissue infections using an aggressive medical regimen including intravenous polyspecific immunoglobulin together with a conservative surgical approach. Scand J Infect Dis. 2005. 37(3):166-72. [Medline]. Sarani B, Strong M, Pascual J, Schwab CW. Necrotizing fasciitis: current concepts and review of the literature. J Am Coll Surg. 2009 Feb. 208(2):279-88. [Medline]. Korhonen K. Hyperbaric oxygen therapy in acute necrotizing infections with a special reference to the effects on tissue gas tensions. Ann Chir Gynaecol Suppl. 2000. 7-36. [Medline]. Korhonen K, Kuttila K, Niinikoski J. Tissue gas tensions in patients with necrotising fasciitis and healthy controls during treatment with hyperbaric oxygen: a clinical study. Eur J Surg. 2000 Jul. 166(7):530-4. [Medline]. Krenk L, Nielsen HU, Christensen ME. Necrotizing fasciitis in the head and neck region: an analysis of standard treatment effectiveness. Eur Arch Otorhinolaryngol. 2007 Aug. 264(8):917-22. [Medline]. Sugihara A, Watanabe H, Oohashi M, et al. The effect of hyperbaric oxygen therapy on the bout of treatment for soft tissue infections. J Infect. 2004 May. 48(4):330-3. [Medline]. Green RJ, Dafoe DC, Raffin TA. Necrotizing fasciitis. Chest. 1996 Jul. 110(1):219-29. [Medline]. Riseman JA, Zamboni WA, Curtis A, Graham DR, Konrad HR, Ross DS. Hyperbaric oxygen therapy for necrotizing fasciitis reduces mortality and the need for debridements. Surgery. 1990 Nov. 108(5):847-50. [Medline]. Brown DR, Davis NL, Lepawsky M, Cunningham J, Kortbeek J. A multicenter review of the treatment of major truncal necrotizing infections with and without hyperbaric oxygen therapy. Am J Surg. 1994 May. 167(5):485-9. [Medline]. Gunaratne DA, Tseros EA, Hasan Z, et al. Cervical necrotizing fasciitis: systematic review and analysis of 1235 reported cases from the literature. Head Neck. 2018 Sep. 40 (9):2094-102. [Medline]. Photomicrograph of Fournier gangrene (necrotizing fasciitis), oil immersion at 1000X magnification. Note the acute inflammatory cells in the necrotic tissue. Bacteria are located in the haziness of their cytoplasm. Courtesy of Billie Fife, MD, and Thomas A. Santora, MD. The authors wish to thank Research Assistants Julie Garrison and Jennifer Nearants for their assistance with this Medscape Reference article.